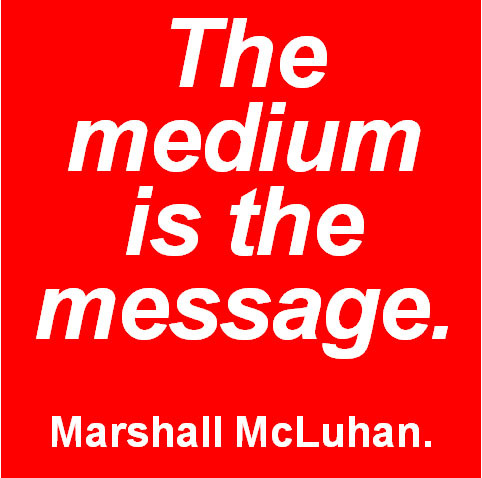 The medium itself, according to McLuhan, not the content it carries, should be the focus of study. Marketing people should have paid more attention to his idea. In the history of the world, there have been only six mass-communication media: (1) Books, (2) Newspapers, (3) Magazines, (4) Radio, (5) Television and (6) The Internet. If “content” was the key ingredient in a medium, you might have expected the leaders in one medium to also be the leaders in the medium to follow. It never happened. The book leaders (Random House, HarperCollins, Simon & Schuster and others) never became successful newspaper publishers. The newspaper leaders (The Wall Street Journal, The New York Times, Gannett and others) never became successful magazine publishers. The magazine leaders (Time, Hearst, Condé Nast and others) never became successful radio operators. Few radio programs made a successful transition to television. And almost no television program made a successful transition to the Internet. Each new medium demands new brands and new content. You can’t move your brand from one medium to the next. The masters of mass communications should have tried to stop publishers from moving their brands onto the Internet. Every major publisher in the world has tried with little to show for their efforts. Among the 100 leading global Internet sites (in terms of traffic), the only traditional publisher is The New York Times, ranked No. 80. Retail is failing into the same trap. As business moves from retail stores to the Internet, many retailers are making the same mistake. Walmart, the world’s largest retailer, launched Walmart.com in the year 2000. Yet today, the website accounts for less than 3 percent of total company sales. Sales at Sears, once the world’s largest retailer, has declined in the past decade from $50.7 billion to $22.1 billion. And the company lost money in each of the past five years. Headline in the March 23, 2017 issue of The New York Times: Sears and Kmart owner warns of substantial doubt they’ll survive. Macy’s, the country’s largest department store chain, is cutting 10,000 jobs and is closing 100 stores. Headline in the January 6, 2017 issue of The New York Times: Department stores, once anchors at malls, become millstones. Payless, the discount shoe chain, is closing 400 stores and filing for bankruptcy. HHgregg also filed for bankruptcy and is closing all 220 of its stores. The company said it was unable to find a buyer. Bebe is closing all of its 175 stores this month and becoming an Internet retailer only. Meanwhile over at the Internet. Chewy.com, a pet-supply site, was purchased by PetSmart for $3.4 billion, a record acquisition for an e-commerce company. After just six years in business, Chewy racked up $900 million in sales last year. Founded in 2010, Warby Parker, the Internet site that sells eye glasses, is currently valued at $1.2 billion. Founded in 2011, the “Dollar Shave Club” website was bought last year by Unilever for $1 billion. Founded in 2013, Casper.com, the Internet site that sells mattresses, is currently valued at $555 million. Things are also booming at Amazon.com, founded in 1994. Sales last year were $136 billion, up 27 percent from the year before. And up 817 percent in the past decade. On the stock market, Amazon.com is worth $445 billion. The New York Times is worth $2.3 billion. How e-commerce is making stores relevant again. That’s the headline in the April 2017 issue of Fortune Magazine. If traditional retailers have any hope of countering Amazon’s dominance, it’s by using their brick-and-mortar stores as local arms of their online businesses. Doesn’t anyone study history anymore? Each new medium demands new brands and new content. But I don’t see that happening. What I see are a host of brands line-extending their way onto the Internet. Within the next two years, according to a recent ANA study, more than 80 percent of ANA marketing members will be conducting business via e-commerce. But are they going to launch new brands or are they going to line-extend their existing brands? If the past is prolog, you know that most ANA members are going to go with existing brands. Two waves of line-extension futility. The arrival of the personal computer was the first wave. Every major high-tech company in the world recognized the importance of this device and promptly jumped into the personal-computer market: Atari, Burroughs, Dictaphone, Digital Equipment, Exxon, IBM, ITT, Lanier, Mitel, Motorola, NCR, NEC, Siemens, Siemens, Smith Corona, Sony, Wang and Xerox. With their existing brand names, of course. And who became the big winner, the largest-selling global personal-computer brand? None of the above. The big winner was Dell Computer, started by a second-year student at the University of Texas. The second wave of line-extension futility started with the arrival of the Internet. And we are seeing a repeat of the first wave. The big winners are not existing brands. The big winners are the entrepreneurs who created new brands like Amazon, Google, Facebook, You Tube, Twitter, Instagram, Pinterest, LinkedIn, Snapchat and many others. The Interest is sending a message to marketing people everywhere. But few are listening.